Antibiotics kill bacteria—both the good and the bad. So whenever antibiotics are used, we need to repopulate the intestinal flora with good bacteria (probiotics). The good bacteria should outweigh the bad so it doesn’t take over and cause problems. Antibiotics can also thin our mucosal lining, leaving us ill-equipped to wrap up pathogens such as parasites and transport them out of the body. This can make us vulnerable to all kinds of foreign invaders and yeast overgrowth. So we build the lining of the intestinal tract using a glutamine-based product. Other contributing factors include excessive sugar, coffee, or alcohol consumption, parasitic infections, and chronic stress. Blood, stool, or saliva lab tests can tell if you have candida. But we have found that a free, easy, at-home spit test to be quite accurate over the years (it was also featured on The Dr. Oz Show). It’s as simple as this: For six days in a row, when you wake up in the morning, fill a glass halfway with room-temperature water (before you brush your teeth or eat or drink anything). Next, work up a dime-sized amount of saliva and spit it into the glass. Check it three times over the course of forty-five minutes to see if your saliva sinks to the bottom, stays floating on top, or if it grows legs, little spindly tails that reach down the glass. If it sinks or grows legs, then you can suspect that yeast is overgrowing in your system. Don’t be freaked out, it happens to so many of us these days, and there is a way to cleanse from it permanently. Does the spit test sound crazy to you? It does to most but we promise it works. To keep candida at bay, keep refined sugar and alcohol to a minimum, and always supplement with a good multi-strain probiotic when you do consume these foods. Eating fresh garlic, oregano, or drinking Pau D’arco tea can do wonders for the immune system (try our Cleansing Pesto Recipe found in the recipe section). Regularly drinking bone broth or adding a high-quality gelatin powder to your smoothie on occasion can help to strengthen the lining of the intestinal tract. How Do I Cleanse From It? 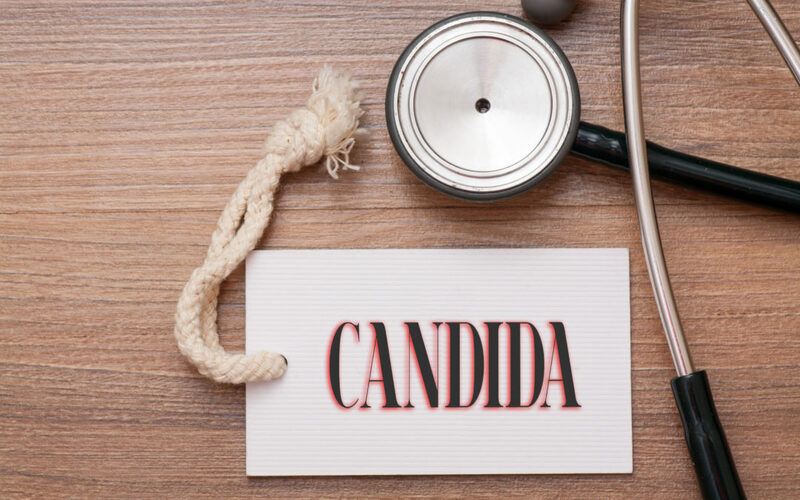 To eliminate candida overgrowth, you must starve it with a special diet, and then kill it with a careful concoction of supplements. Eliminate all yeast, gluten, sugar, white flour, fermented foods and drinks, and most fruit. Complex carbohydrates such as gluten-free grains, legumes, and root vegetables are allowed, but should be limited. Focus on non-starchy vegetables, clean animal protein, and healthy fats including avocado, butter, and coconut oil. Basically, a pretty boring diet that goes on for six to eight weeks. Food-grade diatomaceous earth, these old tiny fossils don’t harm the human body, but act like razor blades to the exoskeleton of the candida. Bentonite clay (in a lot of water) carries the shell out of the body. Antifungals, such as grapefruit seed extract, Pau D’arco, oregano oil, and olive leaf extract kill the candida—just make sure to rotate them every four days. Because candida can only overgrow in a host with limited resistance, we must figure out which other system in the body has been compromised, be it the immune system (with underlying viruses or heavy metals), an organ or a gland (usually the liver, adrenals, or thyroid) or a combination thereof. Those other systems that are out of balance must also be cleansed and strengthened at the same time, in order for the candidiasis to be completely eliminated. If you are interested in learning more or diving into our life-transforming cleanse, head on over HERE. It's an 8-week comprehensive tried-and-tested online candida cleanse and GI repair plan that you can do anytime within one year of enrolling in the program. 7 Ways to Avoid the Afternoon Crash! can the diametous earth and bentonite clay be taken in vegetable capsules or must they be mix with water and drunk?